The LLLWSUAI website has moved. Please update your bookmarks and visit us at our new website at http://www.llwsuai.org. To visit our new site, please click here. Please join us for the 2018 LLWSUAI membership meeting and banquet on Wednesday, August 22 at 10 AM. Tickets are required for this event. Tickets can be purchased by contacting Chuck at 570-772-7416 or Linda at 508-852-1201 by Monday, August 20. Tickets for the meeting and buffet brunch are $15 per person. Menu for buffet: Scrambled eggs, sausage, breakfast ham, breakfast potatoes, stuffed chicken breast, corn, green beans, rolls, and beverage. There will also be a membership meeting at 9 AM for all members to attend. The membership meeting will be held in the Grand Ballroom on the 2nd floor. The 2018 LLWSUAI annual meeting will be held in the Grand Ballroom of the Genetti Hotel in Williamsport, PA on Wednesday, August 22. The Board Meeting will start at 8 AM with the general membership meeting following at 9 AM. The banquet will follow at 10 AM. Meal will include scrambled eggs, sausage, breakfast ham, breakfast potatoes, stuffed chicken breast, corn, green beans, rolls, and beverage. Cost of the buffet is $15. Guests may attend. Tickets must be purchased for the event by Monday, August 20. Please contact Chuck at 570-772-7416 or Linda at 508-852-1201. The LLWSUAI room at the Genetti in Williamsport will be open from 7 PM-12 AM for World Series Alumni and guests. The room is on the 2nd floor of the Genetti. Below is a schedule of events. We hope to see you. Sunday, 8/19: No meal due to the major league game. The room will be open for all who wish to watch the MLB game on TV. Wednesday, 8/22: Join us for the annual membership meeting and buffet banquet. Tickets are required (cost $15). Tickets must be purchased by Monday, 8/20. Contact Chuck at 570-772-7416, Linda at 508-852-1201 to purchase tickets. Any questions about the LLWSUAI organization or events, please contact 570-772-7416 or 508-852-1201. You can now pay your dues for 2017. Our Treasurer Rick Dottellis will take your payment. You can mail in your check . Please download the word document file and mail in your payment by clicking here. Begun in May, 2010 the Genetti remodeled the Washington room with funding that was provided by the LLWSUAI and renamed it the LLWSUAI room. This room will serve as our home for all future World Series in Williamsport as well as our annual meeting. The Hospiality committee then headed by Greg Roberts worked very passionately to see this project through and you will be able to see those results starting with the 2010 Little League World Series. The hospitality committee under direction of Chair Chuck Stimsonworked hard to have a luncheon on Wednesday, August 23, 2017. Please join us if you can. 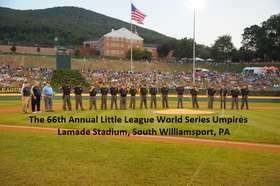 The 2012 Little League Baseball World Series Umpires received their awards at the on field presentation in Lamade Stadium from Mark McGill LLWSUAI President, Chris Thomas LLWSUAI Vice-President, and LLWSUAI Board Member Dave Stoker. JOIN THE UMPIRE REGISTRY NOW! The 2017 Official Little League Umpire Registry membership is now open? All L.L. umpires should be active members of the Registry ..... membership shows your dedication to the goals and ideals of Little League Baseball Inc. Click here to join! LLWSUAI TEAMS UP WITH "PITCH IN FOR BASEBALL"
LLWSUAI would like to announce to its membership that we support Pitch in For Baseball. If you have recently updated your umpire equipment and looking to donate your old equipment Pitch in For Baseball would be a place that you can use. They will see to it that your equipment will be used by somebody who is less fortunate. Little League Baseball asks there leagues to support this organization. So were asking the members of the LLWSUAI to help as well. History of the Association patch- courtesy Little League International Museum. To download and read this interesting article...click here.